Including fish in the family's weekly diet, particularly oily fish such as salmon, mackerel,tuna and sardines is something that some people struggle with. My own boys, given the choice would chose beer battered fish and chips before a salmon or mackerel fillet. 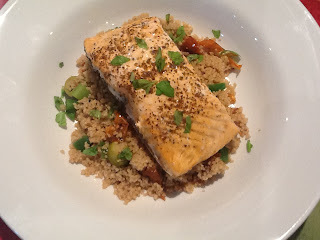 This salmon recipe is one that I cook regularly and if you're looking for a quick salmon dinner then this is one for you. I've also started using 'Seagreens' with many of my recipes and I find it works really well with this dish. Seagreens Mineral salt to season. Place the couscous in a heatproof bowl and pour over 350ml of boiling water.Cover with cling firm and leave for 10 minutes. Place the salmon fillets in an ovenproof dish. Mix the lemon zest and the olive or rapeseed oil together and pour over the salmon. Sprinkle the Seagreens salt over the fish and roast for 8 -10 minutes or until,cooked. Divide the couscous between 4 plates and top with a salmon fillet. Scatter with torn basil and serve.